Joovy, the brand that is known for packing innovative features into products that are sleek and attractive in design, has done it yet again. The Spoon is amongst four new products just added to Joovy's lineup, and we love it for a variety of reasons. Chiefly, because it's a multi functioning baby product; and what seasoned mother doesn't love a baby product that is built to serve more than one purpose? The Spoon serves as a walker, a place to play (the tray is large enough to accommodate several of baby's favorite toys) and as a snack/meal space for your little one. Joovy is a company that clearly knows what parent consumers need. They've made clean up super simple with a tray insert that snaps out easily for cleaning, and is dishwasher safe. The padded seat is also easily removed, and is machine washable. 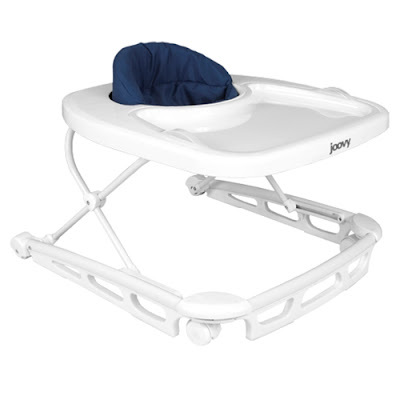 Parents, if you have had the pleasure of experiencing a Joovy product in the past, you know that this is a company that doesn't cut corners. They construct their products using premium materials and build them to withstand years of use with minimal wear. The design and construction of the Spoon is no different. The seat is made with 600D material and combines luggage grade durability with a soft and padded high seat back; providing comfort for your child and the durability that you're looking for as a parent. The Spoon offers three height settings and accommodates your little one from the time that they can sit up unassisted, until they reach the maximum weight /height capacity (30lbs./33.5 inches tall). Joovy has designed the Spoon to withstand hours of active play and mealtimes, while also maintaining it's sleek attractive appearance.We love the space saving multifunctional design of the Joovy Spoon; yet another great product from a brand that clearly understands what parents need. Ready to experience the sleek design and convenience of the Joovy Spoon? 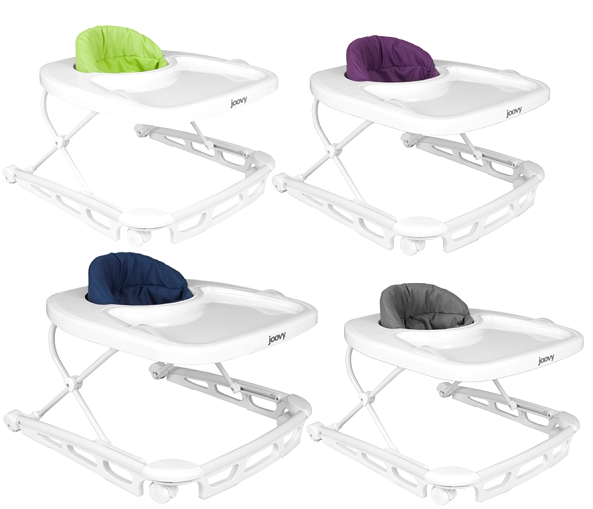 One (1) One Savvy Mom reader will receive a Joovy Spoon in the Blueberry color choice [ARV$99]. Love that the insert is dishwasher safe. Love that the seat pad is machine washable! I love the design and color choices! I like that the seat pops out and goes into the washing machine for easy cleaning! yeah! the machine washable seat is a plus! I love that it folds up. Our house is already covered with baby stuff! I love that it is a highchair and walker all in one. i like how its a walker in general... i have not seen one of those in a while... plus it has washable fabric with is pretty necessary in baby products! I like the sleek design of this walker and multifunctional options. Keep up the great ideas Joovy!